overvoltage resulted from direct lightning strokes in power and light current cable lines. Long-lasting complicated and expensive reconstruction of engineering, cabling systems and equipment are common results of such distressing phenomena. Moreover, machinery break down causes direct losses from production idle time. In order to avoid above-mentioned situations, the BK Company offers one-for-all approach to protection organization by dint of modern systems. This approach allows optimizing of protection system for each specific object, due to its technological effectiveness and modularity. Mentioned approach is not time-consuming and is small-footpring. Additional equipment for installment is not required. Offered technology significantly improves efficiency of overvoltage protective devices and manage the risk of mentioned material losses. Key task of lightning protection system is to "catch" lightning stroke and to ground it, preventing in the same way thermal, electrical and mechanical influences, which may cause damages and are dangerous for people. Reliable and long-lasting grounding is the basis of lightning protection system and safe operation of electrical installations. 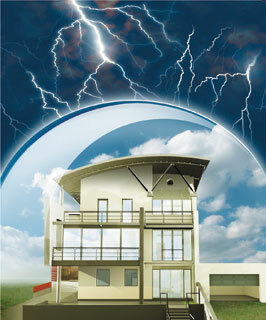 Together with bonding network it helps to avoid dangerous sparking. Moreover, it additionally protects equipment of electrical and data transmission networks if materials were correctly selected and installed in compliance with regulatory documents. The most effective conception of surge overvoltage protection is zone one, which together with correct placement of protected equipment, allows to diminish overvoltage step by step to the safe level for each kind of electrical and electronic equipment, telecommunication systems, data transmission systems, TV, video- and satellite systems. Our approach to lightning protection and grounding issues - is qualitative, professional and innovative solution for effective organization of utility networks complex protection systems.